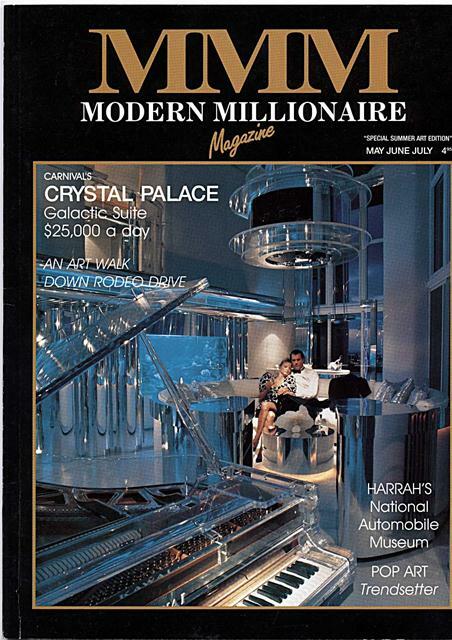 Well, exercise fans, let's take a look into the crystal ball for the '90s. Which new fat burners or diets are going to be hot on the eve of the 21st century? What space-age devices will get - and keep - you slim? If we take the responsible apporach, we will look to the sports scientists. In the seductive and sensuous community of Coto de Caza, Ca., where teal skies frame pastoral estates bordered by exercise and equestrian trails, the science of sports and biomechanics is produced, packaged and perfected. and biomechanics as his tools for solving your total exercise needs. When one initially scans over the list of all these "ologies", it appears you must be a rocket scientist to understand them all. 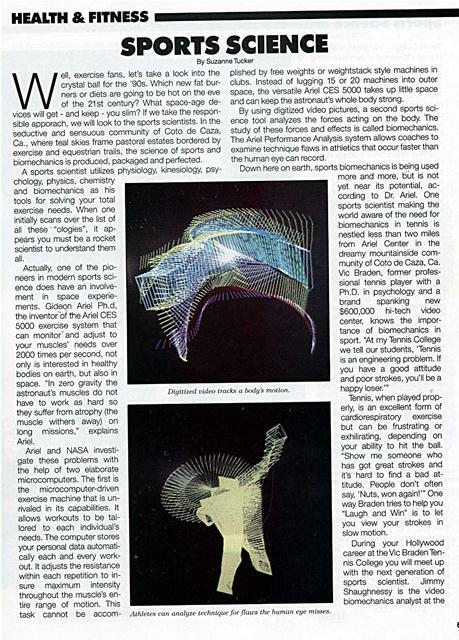 Actually, one of the pioneers in modern sports science does have an involvement in space experiements. Gideon Ariel Ph.d, the inventor of the Ariel CES 5000 exercise system that can monitor and adjust to your muscles' needs over 2000 times per second, not only is interested in healthy bodies on earth, but also in space. "In zero gravity the astronaut's muscles do not have to work as hard so they suffer from atrophy (the muscle withers away) on long missions," explains Ariel. plished by free weights or weightstack style machines in clubs. Instead of lugging 15 or 20 machines into outer space, the versatile Ariel CES 5000 takes up little space and can keep the astronaut's whole body strong. By using digitized video pictures, a second sports science tool analyzes the forces acting on the body. The study of these forces and effects is called biomechanics. 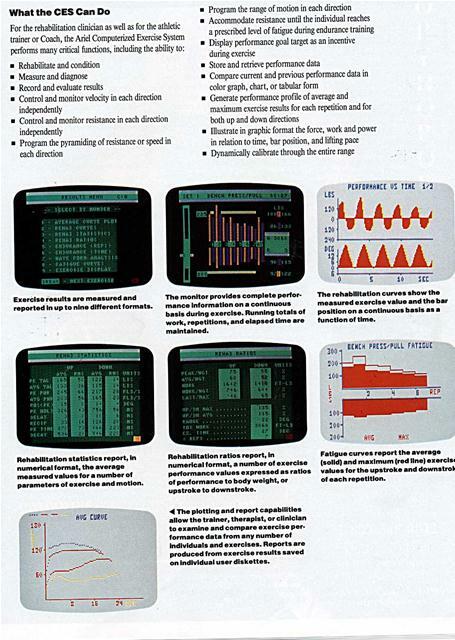 The Ariel Performance Analysis system allows coaches to examine technique flaws in athletics that occur faster than the human eye can record. Down here on earth, sports biomechanics is being used more and more, but is not yet near its potential, according to Dr. Adel. One sports scientist making the world aware of the need for biomechanics in tennis is nestled less than two miles from Ariel Center in the dreamy mountainside community of Coto de Caza, Ca. Vic Braden, former professional tennis player with a Ph.D. in psychology and a brand spanking new $600,000 hi-tech video center, knows the importance of biomechanics in sport. "At my Tennis College we tell our students, 'Tennis is an engineering problem. If you have a good attitude and poor strokes, you'll be a happy loser.'" Tennis, when played properly, is an excellent form of cardiorespiratory exercise but can be frustrating or exhilirating, depending on your ability to hit the ball. "Show me someone who has got great strokes and it's hard to find a bad attitude. People don't often say, 'Nuts, won again!'" One way Braden tries to help you "Laugh and Win" is to let you view your strokes in slow motion. Digitized video tracks a body's motion. Athletes can analyze technique for flaws the human eye misses. Tennis College. "We produce a video of your strokes that shows your swing in slow motion. As you look at your swing you hear the biomechanist explain what you do well and not so well. Then you see one of our staff's mechanically correct strokes so you can compare the two." Braden's new video production center will soon be offering this service with professional video and audio quality. Shaughnessy sees exercise in the nineties headed toward the home. "In the competitive world we live in, time is the most valuable commodity. Exercise tends to lengthen and enhance your life, but fitting exercise into your daily schedule can be a time based problem. With the Ariel 5000 not only can you bum approximately 35% more calories than free weights, 29% more than Nautilus, you can do it in half the workout time. This system is important for rehab and sports training now (i.e., Denver Broncos, Philadelphia Eagles, physical therapists, etc. ), but its home fitness potential is truly phenomenal. Instead of an extra Mercedes you can buy the most efficient way to exercise your body. You won't need a car to drive to the fitness club, and it takes up less space too!" While studying for his Masters at the United States Sports Academy, Shaughnessy studied intensely under Ariel and Michael Yessis Ph.D, editor of the Soviet Sports Review. Yessis, who has been educating America about the Soviet Union's scientific approach to fitness and athletics for over 22 years, says, "Most Americans don't know that the Soviets are very willing to discuss their methods." Yessis claims the Soviets "have the most advanced stereo-photographic, optico electronic, laser and telemetric registration techniques anywhere in the world." To say the least, this type of feedback can be a little more valuable than the typical output you get from the "No pain-No gain" style coach or personal fitness trainer. Yessis and Ariel agree that the Soviets excel because their coaches are more educated in the sports sciences (at least a Master's degree at international level). The fact is that Soviets optimize their training time. Now Americans can do the same. 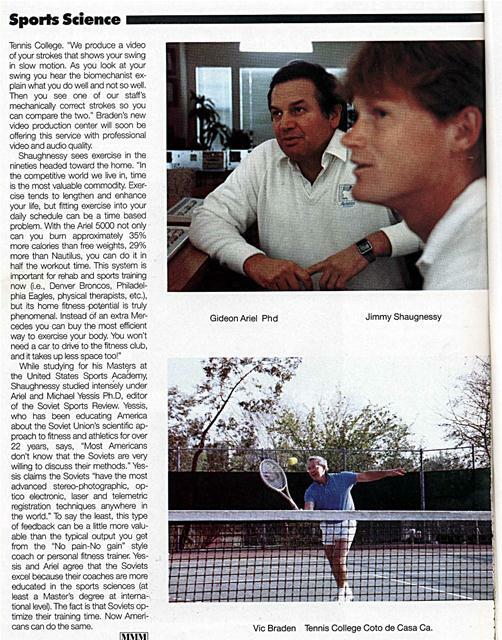 Vic Braden Tennis College Coto de Casa Ca. 1 The plotting and report capabilities allow the trainer, therapist, or clinician to examine and compare exercise performance data from any number of Individuals and exercises. 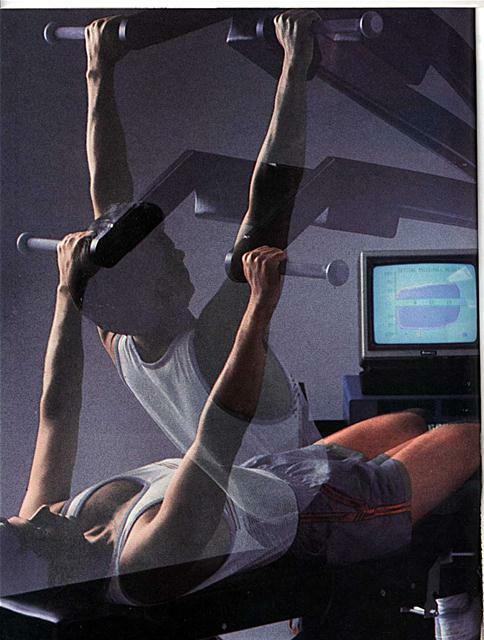 Reports are produced from exercise results saved on individual user diskettes. Fatigue curves report the average (solid) and maximum (red line) exercise values for the upstroke and downstrok of each repetition. Generated on 4/20/2019 3:49:48 PM (PST) ADI/HQ/GBA/2019/ARIELCLOUD/v3.0.2018.0126.